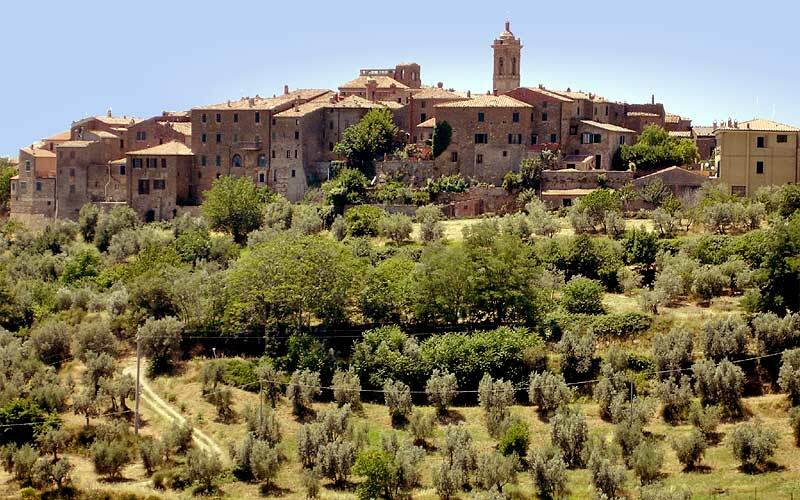 Leaving L'Amorosa and turning right, you will come to Torrita di Siena, an ancient hamlet dating back to 1100, still partially surrounded by defensive walls. Walk through the small medieval streets of it's historical centre. 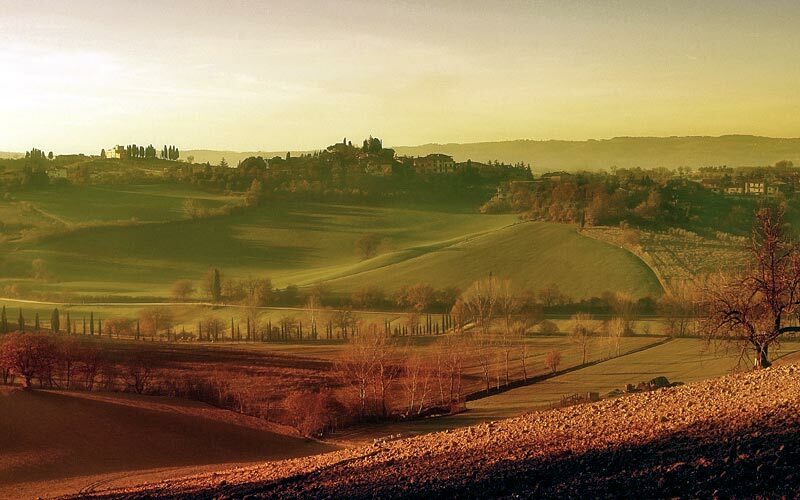 Continue for Montefollonico, with it's sweeping views over the entire Val di Chiana (valley of the river Chiana). Turn back until the fork in the road at "Osteria delle Noci" and continue in the direction of Petroio. Park beneath the town, and walk through this small medieval town to visit the Museo della Terracotta (terra-cotta museum). Continue in the direction of Castelmuzio, another small medieval town of Etruscan-Roman origin. 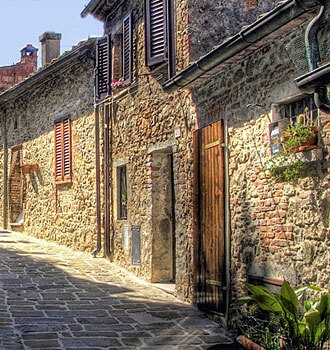 Stroll through the narrow alleyways of Castelmuzio and look out over the pristine landscape. Continue towards Montisi. En route, don't miss visiting the Pieve di Santo Stefano in Cennano (church of Saint Steven) of paleochristian origin. Then, pass Montisi and head for Trequanda, the first recorded mention of which dates back to 1198, enter the beautiful Romanesque church and walk along the streets of this small medieval hamlet. From here proceed in the direction Asciano until you reach the small village of Collalto. Here you come to a crossroads with signs for Farnetella and Scrofiano. 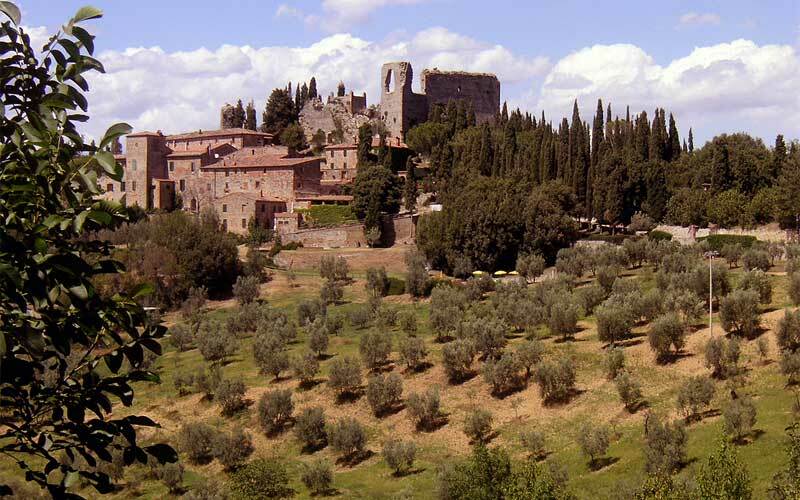 Follow directions for Scrofiano, they will lead you to a charming medieval village rich in art. The collection of the '"Museo di Arte Sacra"' (museum of religious art) adjacent to the Collegiata di S. Biagio (collegiate church of Saint Biagio) is particularly worth seeing. You can then backtrack towards Collalto and proceed towardsFarnetella, along a gravel road that, after Farnetella, will lead you towards the valley floor, you then follow signs for Rigomagno '"Colle degli Olivi"' (the hill of olives trees). From here you will cross the border into the Arezzo province to reach Lucignano "la Perla della Val di Chiana" (the pearl of the Chiana river valley). Walk through Lucignano's concentric alleyways, and visit the Museum where, amongst the many important artworks, there is the "Albero della Vita" (Tree of Life) also know as "Albero dell'Amore" (Tree of Love) dating back to the 15th Century and the world's only example of a reliquary in the form of a tree. From here, follow signs for Sinalunga and visit the town's historic centre. In this, the old part of the town, you will find the Palazzo Pretorio (town hall), a miniature copy of the Palazzo Pubblico of Siena and of the Torre del Mangia (tower of the Mangia). Also worth a visit is the 19th Century theatre of Teatro Ciro Pinsuti. Visit the Collegiata di San Martino (collegiate church of Saint Martin), the Chiesa di Santa Lucia (Church of Saint Lucia) and of Madonna delle Nevi (Church of Saint Mary of the Snows). Back in your car, drive up to the Convento di San Bernardino (convent of Saint Bernard) were the Holy Mary of Refuge is venerated, patron Saint of the Val di Chiana. From here, a beautiful view over the entire valley can be enjoyed. The important and ancient church, the Romanesque Church of San Pietro ad Mensulas (church of Saint Peter at the Mensulas) located in the lower part of the town, known as Pieve di Sinalunga is also of interest.